I’m SO EXCITED to announce the preorder sale for the weekly devotional- Love’s Great Design by Angel Simmons! Here’s YOUR chance to preorder your copy before it’s released THIS MONTH! 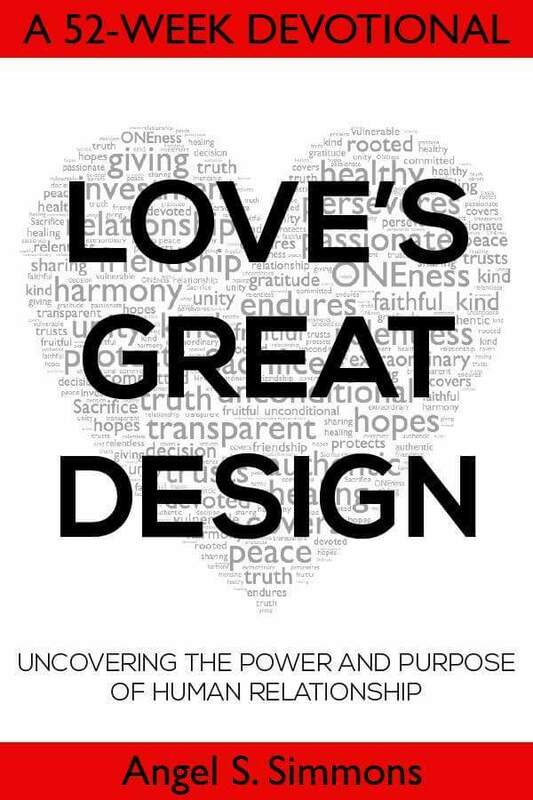 Love’s Great Design is not just a book- it’s a mandate from the Word; it’s a lifestyle for God’s people; it’s how we were created to function in relationship. The lessons taught here are opportunities to experience an extraordinary life full of and covered in love. Ultimately, that is the design for living our BEST life ever! This entry was posted in BLESSINGS, CHILDREN, COMMUNITY, CONNECTIONS, FAITH, FAMILY, FRIENDSHIP, JOY, LOVE, MARRIAGE, ONENESS, REAL LIFE, RELATIONSHIP, ROMANCE, SPIRITUALITY, WELLNESS and tagged author, blogger, book, book release, devotional, love, Love's Great Design, preorder, published, sale, The Message Inc, writer.